Sally Field as "Norma Rae" in a pivotal scene from the movie. Demonstrations and vigils are only two ways of expressing need for social change. Motion pictures have vaulted from their early history ("The Grapes of Wrath," anyone seen it?) to the front of the theater, telling stories that showcase an issue and how the film's characters band together and overcome. More recently, legal thrillers, such as "Erin Brockovich," have typified the art of producers, directors and filmmakers making a social statement. The risky rewards of whistleblowing have tackled injustice, discrimination, gender abuse, drug and people trafficking, and political corruption. 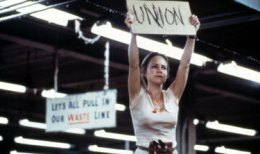 Sally Filed portrayed the poor working conditions at textile and other manufacturing plants in "Norma Rae," directed by the late Martin Ritt. "Silkwood" told how a nuclear plant worker unmasked radiation emissions and paid for it with her life. Last week, the USC School of Cinematic Arts continued the tradition by hosting a panel surrounding the "change" expressed in the Academy Award nominated, "The Help," which espouses plights of domestic workers. Tate Taylor, director and writer of "The Help" appears in the first clip from the seminar. In the following clip, Octavia Spencer discusses how the ensemble cast conveyed the film's message to viewers. Seminal films, including “To Kill a Mockingbird,” “In the Heat of the Night,” “Guess Who’s Coming to Dinner” and “Norma Rae” remind everyone that the smallest acts of courage can inspire social change. This tradition continues with the recent film “The Help,” which examines the relationships between black maids and their white employers in 1960s Mississippi. The film reminds audiences that popular culture has the power to affect change and illuminate the plight of those without a voice. Based on one of the most talked about books in years and a #1 New York Times best-sellingphenomenon, “The Help” stars Emma Stone (“Easy A”) as Skeeter, Academy Award®–nominated Viola Davis (“Doubt”) as Aibileen and Octavia Spencer as Minny—three very different, extraordinary women in Mississippi during the 1960s, who build an unlikely friendship around a secret writing project that breaks societal rules and puts them all at risk. From their improbable alliance a remarkable sisterhood emerges, instilling all of them with the courage to transcend the lines that define them, and the realization that sometimes those lines are made to be crossed—even if it means bringing everyone in town face-to-face with the changing times. Deeply moving, filled with poignancy, humor and hope, “The Help” is a timeless and universal story about the ability to create change. The ensemble cast also features Jessica Chastain, Bryce Dallas Howard, Emmy® Award winner Allison Janney, Chris Lowell, Oscar® winner Sissy Spacek, Academy Award® nominee Cicely Tyson and Mike Vogel. Finally, Al-jen Poo, president and co-founder of the National Domestic Workers Alliance discusses organizing workers to effect change.